Create customized Christmas cards with your favorite photos! We offer several card styles and numerous templates to spread the holiday spirit to friends and family in style. Whether you’re looking for classic or modern card styles, Winkflash has them all. Our online card builder makes the process easy and you can upload your photos directly from your phone to get your card layout started. 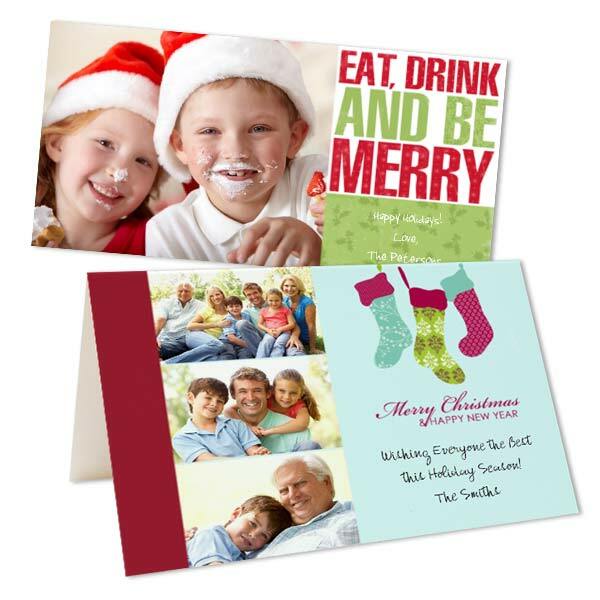 Choose from classic glossy photo paper cards, or make your own cardstock Christmas cards that you can print front back with photographic treasures and your own message! For a traditional holiday feel, we offer folding photo Christmas cards which you can design inside out with your own personal touches. To make your own Christmas cards, browse your phone or laptop to find the perfect photo. Maybe you have last year’s Christmas pictures, some wedding photos, or several snapshots of your kids that you can use to create your collage. Upload them to Winkflash, and arrange them on your card layout to share your memories with friends and family. Additionally, you can use our blank card template if you prefer to create your own artwork for a holiday greeting that’s uniquely “you”. Once you’ve completed your design, use our text feature to include your own holiday greeting with a variety of fonts and colors to compliment your photos. At Winkflash, you can order photo cards cheap for virtually any occasion. If you’re looking for more ideas, check out our full personalized holiday card collection which includes custom printed Hanukkah cards, Thanksgiving greetings and New Year’s cards! Wish everyone the best during the holiday season or use them to create unique holiday invitations for your upcoming festivities.